Microorganisms require nitrogen to make up 10% of their cellular composition, and the activities of bacteria also can have considerable inﬂuence on the nitrogen cycle. The principal reservoir for nitrogen in the atmosphere. According to the amount of organic nitrogen, land organisms contain about 5×1015 g N, soil contains 6.5×1015 g N, and oceans contain about 8×1017 g N (Schlesinger 1991). Approximately 1.7×1014 g N per year are converted to NH3 by nitrogen-ﬁxing prokaryotes as either free-growing or as symbiotic bacteria and in comparison, lightning combustion accounts for about 1.9×1013 g N ﬁxed per year. When one considers the global cycle of nitrogen (see Figure 10.10) and the rates of conversions, the amount of time that a nitrogen molecule would be present in the organic form is about 370 years. 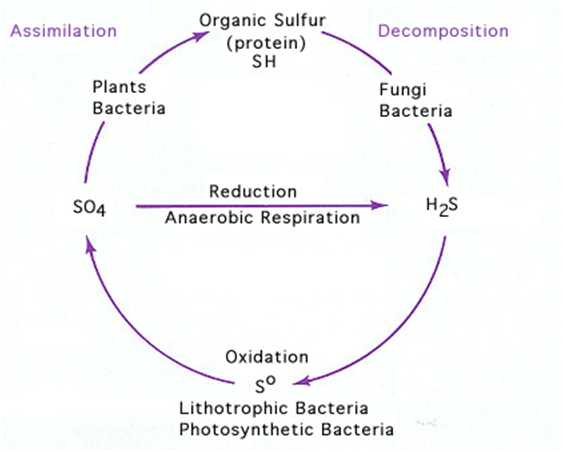 One important aspect of the nitrogen cycle is biological nitrogen ﬁxation, which is the conversion of atmospheric N2 to ammonia by prokaryotes. The enzymology for this reaction is unique in that the reduction of the triple bond between nitrogen atoms requires nitrogenase, which is activated by an electron donor (e.g., pyruvate). Electrons are transferred to the nitrogen atoms by a special iron–molybdenum complex. At least 16 ATP is required to energize the substrate-enzyme complex, making this an extremely energy-expensive reaction (see Table 10.4). A feature that is poorly understood is that nitrogenase releases one molecule of H2 along with two molecules of NH3. Nitrogenase with the FeMo metal center is the most common enzyme; however, some bacteria produce alternate enzymes containing iron plus vanadium or only iron. These alternate enzymes are produced when molybdenum or vanadium are limiting in the environment, and this underscores the importance of nitrogen ﬁxation to support prokaryotic growth. While nitrogen ﬁxation is limited to a few species of prokaryotes, most microorganisms can readily assimilate NH3 into amino acids and other organic compounds. The release of NH3 from organic nitrogen compounds, known as mineralization, is attributed to enzymatic deamination reactions found in many microbial cells. Nitrogen is used by living systems for the synthesis of amino acids, nucleic acid bases, and various organic nitrogen compounds. The nitrogen source for animals is amino acids; for plants it is nitrate; and for bacteria, it may be nitrate, ammonia, or dinitrogen. If ammonium ion is available, microorganisms will assimilate ammonium to form amino acids. The conversion of N2 to NH3 requires at least 16 mol ATP for each mole of N2 ﬁxed, and for each mole of l-glutamine formed, one mole of ATP is required. However, if nitrate is the nitrogen source nitrate must ﬁrst be reduced to ammonium, and this reduction process is referred to as assimilatory nitrate reduction. There are a series of interconversions of inorganic nitrogen compounds involving ammonia, nitrite, and nitrate. This anammox reaction releases energy (G◦ =−357 kJ) that provides enough energy for autotrophic growth of the anaerobe B. anammoxidans. Each of these steps in the reduction of nitrate to dinitrogen releases sufﬁcient energy to support bacterial growth on that speciﬁc reaction. The denitriﬁcation pathway is also referred to as dissimilatory nitrate reduction because nitrate or nitrogen oxides are ﬁnal electron acceptors that enable bacteria to grow. The nitrogen cycle is the process by which nitrogen is converted between its various forms. The transformation is carried out through both physical and chemical process. The important process in the nitrogen cycle includes fixation, ammonification, nitrification and denitrification. The majority of earth’s atmosphere is nitrogen (78%), making it the pool of nitrogen. However, atmospheric nitrogen has limited availability for biological process, leading to scarcity of the usable nitrogen in many types of ecosystem. Nitrogen is necessary for all known forms of life on Earth. It is a component of all amino acids, as it is incorporated into proteins, and is present in the bases that make up nucleic acids such as RNA and DNA. Nitrogen is present in the environment in a wide variety of chemical forms including organic nitrogen, ammonium (NH4+), nitrite (NO2−), nitrate (NO3−), nitrous oxide (N2O), nitric oxide (NO) or inorganic nitrogen gas (N2). Many of those processes are carried out by microbes, either in their effort to harvest energy or to accumulate nitrogen in a form needed for their growth. The processes of nitrogen cycle are discussed below. Atmospheric nitrogen must be processed, or "fixed", in a usable form to be taken up by plants. Between 10x1012 and 5x1012 g are fixed by lightning strikes, but most fixation is done by free-living or symbiotic bacteria known as diazotrophs. These bacteria have the nitrogenase enzyme that combines gaseous nitrogen with hydrogen to produce ammonia, which is converted by the bacteria into other organic compounds. Most biological nitrogen fixation occurs by the activity of Mo-nitrogenase, found in a wide variety of bacteria and some Archaea. Mo-nitrogenase is a complex two-component enzyme that has multiple metal-containing prosthetic groups. An example of the free-living bacteria is Azotobacter. Symbiotic nitrogen-fixing bacteria such as Rhizobium usually live in the root nodules of legumes (such as peas, alfalfa, and locust trees). Here they form a mutualistic relationship with the plant, producing ammonia in exchange for carbohydrates. Because of this relationship, legumes will often increase the nitrogen content of nitrogen-poor soils. A few non-legumes can also form such symbioses. Plants take nitrogen from the soil by absorption through their roots as amino acids, nitrate ions, nitrite ions, or ammonium ions. Plants can absorb nitrate or ammonium from the soil via their root hairs. If nitrate is absorbed, it is first reduced to nitrite ions and then ammonium ions for incorporation into amino acids, nucleic acids, and chlorophyll. In plants that have a symbiotic relationship with rhizobia, some nitrogen is assimilated in the form of ammonium ions directly from the nodules. The conversion of ammonia to nitrate is performed primarily by soil-living bacteria and other nitrifying bacteria. In the primary stage of nitrification, the oxidation of ammonium (NH4+) is performed by bacteria such as the Nitrosomonas species, which converts ammonia to nitrites (NO2−). Other bacterial species such as Nitrobacter, are responsible for the oxidation of the nitrites into nitrates (NO3−). *3+ It is important for the ammonia to be converted to nitrates or nitrites because ammonia gas is toxic to plants. 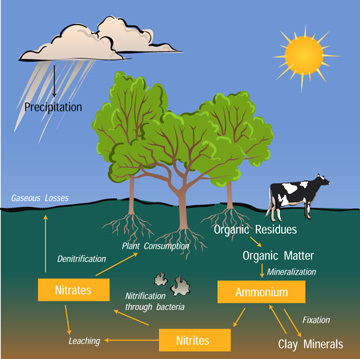 Due to their very high solubility and because soils are highly unable to retain anions, nitrates can enter groundwater. Elevated nitrate in groundwater is a concern for drinking water use because nitrate can interfere with blood-oxygen levels in infants and cause methemoglobinemia or blue-baby syndrome. Where groundwater recharges stream flow, nitrate-enriched groundwater can contribute to eutrophication, a process that leads to high algal population and growth, especially blue-green algal populations. While not directly toxic to fish life, like ammonia, nitrate can have indirect effects on fish if it contributes to this eutrophication. Denitrification is the reduction of nitrates back into the largely inert nitrogen gas (N2), completing the nitrogen cycle. This process is performed by bacterial species such as Pseudomonas and Clostridium in anaerobic conditions. They use the nitrate as an electron acceptor in the place of oxygen during respiration. These facultatively anaerobic bacteria can also live in aerobic conditions. Denitrification happens in anaerobic conditions e.g. waterlogged soils. The denitrifying bacteria use nitrates in the soil to carry out respiration and consequently produce nitrogen gas, which is inert and unavailable to plants.